Maria was a kind, careful, highly biddable Terv. She started her career as a full-time service dog at 9 months of age because that was when Kristina needed her. She served with dignity and careful attention to her tasks for 9 years, retiring when Kristina no longer needed a full-time service dog. Maria has an amazingly nurturing temperament. In her career as a Service Dog she went to college classes, even walking with Kristina during graduation. Sometimes highly-charged environments made her nervous, but she never refused her duties and always carried out her tasks with great efficiency. She became infamous among students for her ability to know (sometimes before the humans) when someone was pregnant. If anyone she knows is injured, she worries over their injury, even if it isn't readily visible. Maria has participated in Kristina's professional animal research for many years. In one remarkable study, Maria's memory proved longer and more accurate than any dog tested. It is clear that her early training and experiences have made her a dog with some exceptional mental prowess. Even at an increasing age, Maria was still agile and strong, often shocking folks with her ability to jump onto high places and speed. 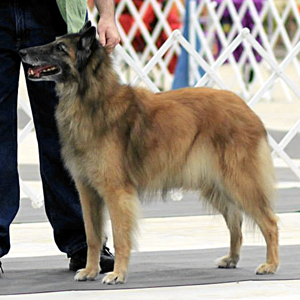 Maria was bred by Janice L. George, DVM MS of Lexington, Kentucky, Linda Ann (Casper) Sayre, DVM of Bloomington, Indiana and Kristina F. Pattison, MS of Lexington, Kentucky.